How in the world can I copy phone numbers from EMAIL messages? This is so infuriating. Frequently I need to copy phone numbers from email messages and paste them into either another message, update a contact or share it via text. However, when I long-press on a phone number inside of any message, NOTHING happens. The only option I have is to tap the phone number, go to the dialer, long press on the phone number in the dialer, copy it, and then go back to where I need to go. 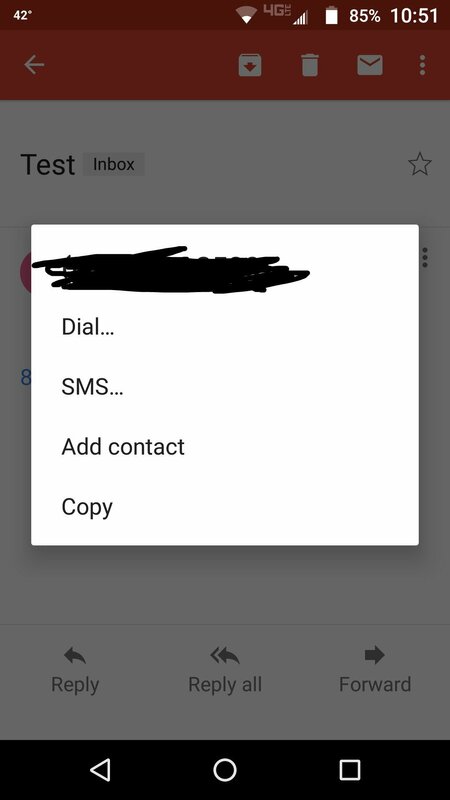 You should be able simply long-press on a phone number and it should pop up an option to COPY (or dial or whatever). The same thing goes with email addresses. I'm trying to get used to Android after migrating from Blackberry 10, which in my opinion when it comes to PRODUCTIVITY and simple things like this, is still miles better than Android (or iOS). This is one of the many little nuances that I can't stand about Android. Sorry, I came here to ask a question and ended up venting a little Smh. Anyway is there something I'm missing??? Using Gmail app? I get the option on a long press. I'm trying to copy a phone number or an email from the in-built email app on Samsung s8 too.. simply doesn't work. when I try to do a long press on the phone number the number simply highlights blue for a second and then goes back to normal. it doesn't remain highlighted. when I tap on another word in the email, it remains highlighted and the copy menu appears. very frustrating!! I have to highlight the word next to it and drag the markers around the number or email address to be able to copy it. was able to do this on my HTC. very short sighted of Samsung! ok, so there is a kind of workaround which will do for now. you need to forward the email and then you are able to copy phone numbers and email address. it will do until they sort this out! Or just use a different email app. No one is forcing you to use an app that doesn't have the features you want. Does anyone know how the screen holds up in direct sunlight? Is the HTC 11U Eligible for Uh-Oh coverage? Why is my outlook sent emails turning into phone contacts?